That is awesome. I have been thinking of doing something similar (but I am much less talented than you). Not for a TV but for my truck camper. TC's usually have a couple of "hampers" up in the cabover that are essentially useless. I am thinking a raising wardrobe would allow the better use of this space. If you can post more on how you did this one for the TV, I would be very interested.. I also took about 15 ft of 1/4 cable and slid heat shrink over it all. Then looped both ends and crimped them with some huge barrels I cut off some #4 lugs. It is our $0 cable lock that I can weave through everything and padlock to the rack. It is sad that the gen pop can't be trusted but better to be safe than end up missing a bunch of stuff. Sportech that is awesome, my wife wanted me to build the same thing inside a cabinet with a fireplace on the front to replace our euro lounger across from our sofa, but just haven't found time to get to it. 4x4dually that is a very handy rack looks like you can haul alot of the extra stuff that doesn't belong inside on the floor. Got to love the Mods, that people come up with. to 4x4dually, You could save your wife's back by buying a Honda EU generator. Been looking at the newer units with their LED exterior lghting. So, buy a new rig or add what you want. We found a 16 ft length of LED lights. They are water proof and self adhesive. Plus, the price as only $45 at the junk show was just right. I cut the strung in half and soldered the ends together. Next I soldered in a lead to go to the yellow bulb on the porch light. I did not want to drill holes into the shell of the traler. So, I ran the wires into the porch light and tied into the yellow bulb. Finished it off with silicon sealant and buried he wiring with EternaBond. Sweet look, affordable. Didn't have to buy a new trailer. Very nice job Pricejh. Where did you buy the string light? I might like to do the same to my RV. Added smart tiles in the kitchen to cover our ugly border in the kitchen. Working on putting these in the bathroom as well. And three to four times the cost. 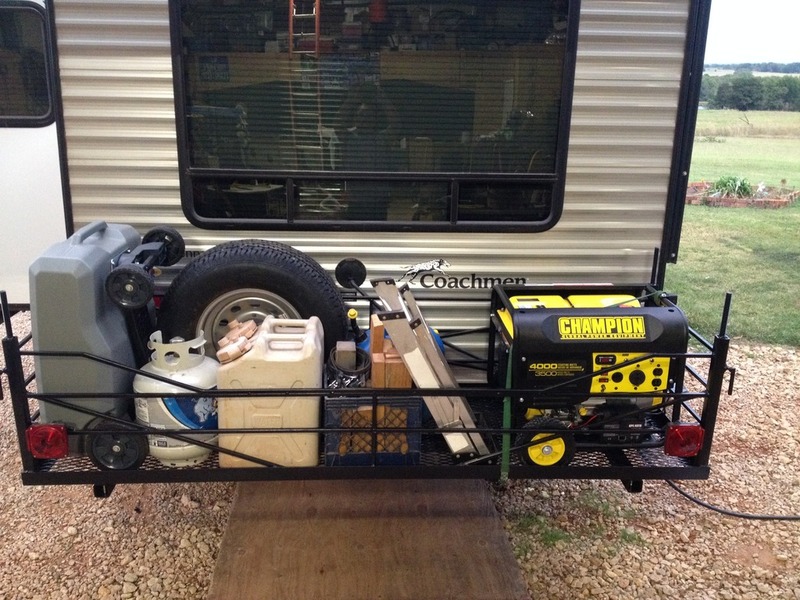 We will possibly use the generator 3-4 times a year max so I couldn't see spending $2K on a Honda. 4X4 Dually - Pin Weight? I'm just completing a refurb on a 1985 Aspenlite 25 fifth wheel. It has a large frame mounted carrier added by PO. I intend to carry generator, spare, etc., etc., just as you do. Also tow with 4x4 dually, but haven't had this on the road yet. Concerned about long cantilver reducing pin weight, and added weight on rear axle. Did youi notice any difference in handling with the carrier loaded?